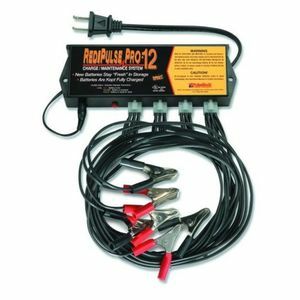 If you sell, stock or service lead-acid batteries, you need the PulseTech PRO-12 Charge/Maintenance System! It is designed to keep new batteries factory-fresh while they rest on the shelf waiting to be installed or sold. PulseTech's patented pulse waveform technolgy is proven to reduce and prevent sulfation buildup on lead acid batteries, whether the batteries are in use or in storage. A primary cause of battery failure is the buildup of lead sulfate crystals on the battery plates. Lead sulfate forms as a result of normal battery function, but over time a residue of sulfate will remain on the battery plates and crystallize. This crystallized sulfate is no longer available in the battery electrolyte, and insulates the active battery plate material from the remaining active electrolyte, leading to the eventual 'death' of the battery. The PRO-12 uses the scientifically-proven ReNew-IT Pulse Technology to keep these deposits off the plates. By removing these energy-dampening deposits, your batteries are stronger than ever. This means your shelf-life warranty issues and other battery-related expenses are reduced dramatically. Located on the top of the unit, the LEDs show the condition of each battery, one at a time. An Audible Alarm indicates improper connections.